Factory GMP focus on good processing environment to support a hygienic production to produce safe and quality products. ISO Specialist â„¢ is specializes in construction activities subject to GMP requirements for food, pharmaceutical and medical devices industries. 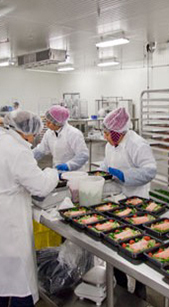 Depending on the client's needs, our GMP Consultant will following the client through the entire project as a building owner consultant, or disciplinary specialists from designing stage until the completion of the project to ensure your factoryâ€™s GMP is meeting the ISO/Halal certification standards. Analyze human flow, material and product flow, processing flow etc. Provide advice on changing room, waste disposal, cleaning and sanitation requirements. Evaluate suitable construction material for the intended used eg. exposy flooring, PVC wall paneling, lighting, ceiling etc. Developing GMP Standard Operating Procedure (SOP). Implement GMP personal hygiene on personal protective garments, hairnet, face mask etc. When you set out to construct complex Pharmaceutical, Food and Medical Devices Plants, it is vital to combine understanding of the technical process with GMP/HACCP/Medical Devices/Halal hygiene and process flow knowledge to achieve certification conformance. With this solid process knowledge, ISO SpecialistTM is in a position to cover the entire project right from the initial process of designing, if required to monitor construction until completion with the aim to make sure it meets the certification requirements. We also take on total responsibility for delivering the complete package in the project management, sometimes working with partners and subcontractors.